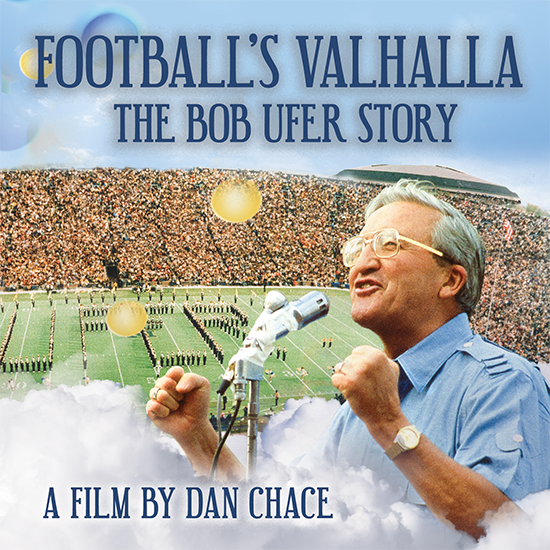 Thank you for supporting Football's Valhalla: The Bob Ufer Story, a full-length documentary about legendary broadcaster Bob Ufer!! Bob's inspirational life story celebrates a shared tradition of enthusiasm for the University of Michigan and it's football traditions. Donations are still needed to fund the presentation of this low-budget feature documentary film, and will be gratefully accepted through the end of 2018. Donations received now will be applied to post-production editing costs and a national screening tour for the film, which will bring it to Michigan Alumni and other fans of Bob Ufer and Michigan Football in cities around the country. If you'd like to arrange a screening event in your community, please contact Dan Chace, at info@blackpointwest.com. Donations made here, are received by not-for-profit fiscal sponsor Media Process Educational Films, Chicago IL (EIN# 36-3723689). MPEF is a specialist in creating and supporting documentary films, and is led by a University of Michigan alum. Donations made here, on behalf of Football's Valhalla, The Bob Ufer Story, are tax-deductible. Contributions may be made by debit card, credit card or check. A receipt for your gift will be automatically generated! Thank you for supporting this film! Please Note: Unfortunately, the deadline for recieving donor perks and listing in the film's credits has passed. Donors/investors who have interest in future projects created by Black Point West Films, are encouraged to contact its CEO, Dan Chace, at: info@blackpointwest.com, and follow Black Point West Films via social media, through our website at www.BlackPointWest.com. I wish to remain anonymous. Please do not include me in the film credits. USD Thank you for your generosity! Step #3: SUBMIT YOUR DONATION!